alaTest has collected and analyzed 11 reviews of DXG DXG-572V. The average rating for this product is 2.8/5, compared to an average rating of 4.0/5 for other Camcorders for all reviews. Views about the battery and usability are on the whole positive. The reliability and price are also mentioned favorably. We analyzed user and expert ratings, product age and more factors. 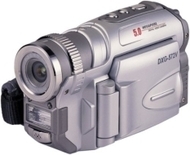 Compared to other Camcorders the DXG DXG-572V is awarded an overall alaScore™ of 78/100 = Good quality. alaTest has collected and analyzed 11 user reviews of DXG DXG-572V from Amazon.com. The average user rating for this product is 2.8/5, compared to an average user rating of 3.9/5 for other Camcorders on Amazon.com. People are impressed by the battery and usability. The reliability and price are also mentioned favorably. 45% of the reviews on Amazon.com give this product a positive rating. The DXG-572V records MPEG-4 video and captures still pictures with clarity and color. This video camera features a 5.0MP CMOS sensor, 4X digital zoom, and a 2.0" flip-out LCD screen. With all these, the DXG-572V brings the bang for your buck.